For years, I taught students in my dog-training classes that the most vital skill they’d need to develop was timing. Timing your marker signals (e.g., clickers) to pinpoint a dog’s desirable behaviors and timing your rewards (e.g., food treats) so that they occur immediately after a dog’s desirable behavior vastly improves the efficiency of training. To help my students master accurate timing, I regularly ask them to practice using their clickers to mark fleeting instances of behavior, such as the moment an actor in a TV show turns his head to the left or raises his arm above waist level. Seeing sounds easy. After all, we “see” our dogs all the time. Rarely, though, do we spend time just sitting back and watching how they move, noting what behaviors they do most often, discerning patterns or sequences of actions. This seems so passive, especially when what we typically want to do while training is be active: issuing commands, luring or prompting, physically guiding the dogs to do what we want. In doing so, we tend to miss all sorts of subtle movements in our dogs — turning the head away, showing the whites of the eyes, dropping a tail, rising up on the front of the paws, yawning, lifting the whiskers, and many more – which can indicate how they’re feeling in various situations. Try conducting a brief experiment. For five minutes a day for one week, become an ethologist (i.e., a scientist who studies the behavior of animals in natural settings), following in the footsteps of Konrad Lorenz or Jane Goodall. But instead of observing the behavior of geese or chimps, observe the behavior of your dog. Pick a time when he is likely to be active, not napping. You could let him into your fenced yard and watch from an inside window. You could pretend to be talking on the phone in the kitchen, but instead be spying on his movements in the living room. 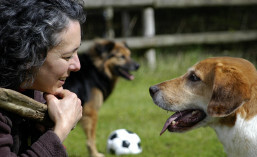 If you have a single dog, you might consider inviting a doggie friend over to instigate playing and activity. Use a notepad and pen, a laptop computer, or your smart-phone’s voice recorder to list the behaviors you see over the course of five minutes. For example, you could note what your dog is doing at at the end of each 30-second period. Pay attention to both the dog’s entire body and to all his separate body parts: head, tail, ears, mouth, legs and eyes. Also listen for vocalizations; barking, yipping, howling and growling are behaviors too. This list of behaviors is a partial ethogram for your dog. It provides a description of the range of movements your dog does without any input from you. You will notice that many of these behaviors are useful (e.g., sitting, approaching you) or cute (e.g., cocking the head, spinning in a circle). Now for the next week, conduct your second experiment. This time, you’ll spend five minutes a day for a week being a behaviorist like B.F Skinner. Choose one of the desirable movements your dog makes. It doesn’t matter whether it’s serious or silly. Two behaviors I suggest to students for this exercise are 1) lying down or 2) lowering the chest to the ground in a bowing motion, while the back legs remain straight. Use a click sound (or some alternate acoustic marker such as the spoken word “yes”) to mark the exact instant your dog does this behavior. Pretend you’re taking a picture with the clicker; imagine that your thumb pressing the clicker button is actually pressing the button on a camera photographing the desired behavior. Follow each click (or “yes”) by giving your dog a tiny food treat. You can throw the treat on the ground or hand it to your dog or toss it for him to catch. Over the course of the week, you should notice your dog’s behavior change as a result of your clicking and treating, that is, your reinforcement of the chosen behavior. You will see the frequency of your chosen behavior increase. Your dog should be lying down, or bowing, or whatever you chose, more often. This means you are well on your way to having an “good manners” behavior or a trick on cue, ready to “fire” when you ask for it. This technique of being quiet and still while watching your dog, scanning for behaviors to click and treat, is called capturing. It’s an incredibly clear way to communicate to your dog which behaviors you like. Just remember the basic rule: any behaviors you click and then treat, you’ll see more of. Those behaviors will become more frequent, and possibly more intense and longer in duration too. By simply taking the time to observe your dog’s varied behaviors, and then choosing a few you want to reinforce, you’ll have laid the groundwork for a powerful training program. Besides, watching your dog is so much fun, you’ll likely find yourself doing it more, looking for opportunities to capture great behaviors.